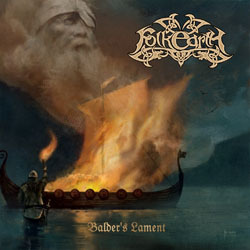 International epic folk Viking metallers Folkearth will soon release their new album, entitled “Balder’s Lament“. It is their 12th full-length album and it will be released as always via Stygian Crypt Productions, hopefully on the beginning of 2014. “Balder’s Lament” will be the first work of the band after the sad news that their founding member Metfolvik (Ravenclaw, Folkodia) passed away. This album belongs in the “metal” repertoire of Folkearth, who have also released some totally acoustic albums in the past. They have already revealed the album tracklist and the epic cover artwork, painted by Kris Verwimp.